GUIDA PER CASSETTI T30C L 300 MM NERA EMUCA 4388614. GUIDA PER CASSETTI MODELLO T30C LUNGHEZZA 300 MM, COLORE VERNICIATO NERO EMUCA. 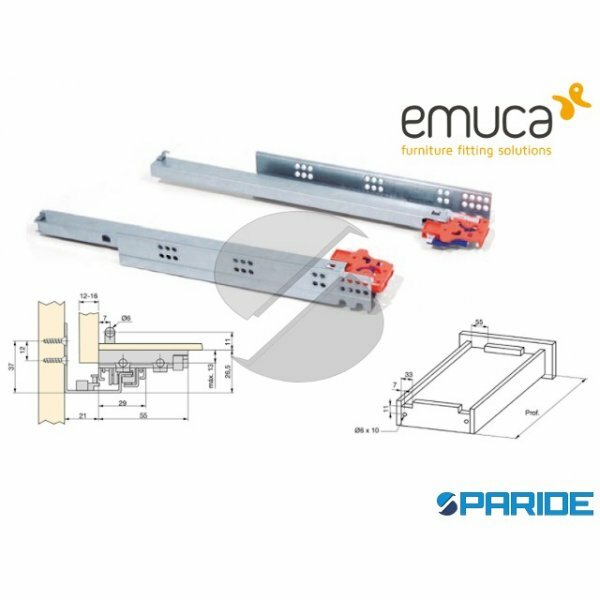 GUIDE PER MONTAGGIO CASSETTI CON ROTELLE, ALTEZ..
GUIDA PER CASSETTI 500 MM T30C 43890 NERA EMUCA. 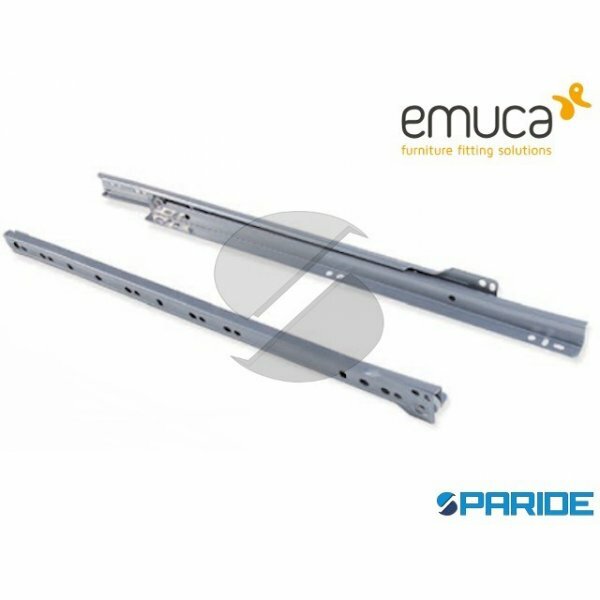 GUIDA PER CASSETTI LUNGHEZZA 500 MM MODELLO T30C, ARTICOLO 43890 NERA EMUCA. SPESSORE GUIDA 13 MM. CHIUSURA A CADUTA, LE GUIDE SI F..
GUIDA PER CASSETTI ZINCATA 350 45 CM OMGE. GUIDA PER CASSETTI ZINCATA ARTICOLO 350 OMGE, LUNGHEZZA 450 MM, ALTEZZA 36 MM, CORSA 355 MM, LUNGHEZZA MASSIMA 790 MM, PORTATA 40 KG. COD..
GUIDA PER CASSETTI ZINCATA 851 40 CM OMGE. GUIDA PER CASSETTI ZINCATA ARTICOLO 851 OMGE, LUNGHEZZA 400 MM, ALTEZZA 33,5 MM, CORSA 294 MM, LUNGHEZZA MASSIMA 679 MM, PORTATA 30 KG. C..
GUIDA SCORREVOLE 351 45 CM SU SFERE PER CASSETTI OMGE. SCORRIMENTO SILENZIOSO SU SFERE, PROFILO PER IL FIANCO DEL MOBILE DOTATO DI FORATURA A PASSO 32 MM, PORTATA PER COPPIA 40 KG ..
GUIDA SLIPPE 290 AD ESTRAZIONE TOTALE SOFT E AGGANCIO 4002605 EMUCA. GUIDA MODELLO SLIPPE, PROFILO 290 MM, AD ESTRAZIONE TOTALE SOFT E AGGANCIO, ARTICOLO 4002605 EMUCA. GUIDA SLIPP..
GUIDA SLIPPE 390 AD ESTRAZIONE TOTALE SOFT E AGGANCIO 4002805 EMUCA. GUIDA MODELLO SLIPPE, PROFILO 390 MM, AD ESTRAZIONE TOTALE SOFT E AGGANCIO, ARTICOLO 4002805 EMUCA. GUIDA SLIPP..
GUIDA SLIPPE 440 AD ESTRAZIONE TOTALE PUSH 3002405 EMUCA. 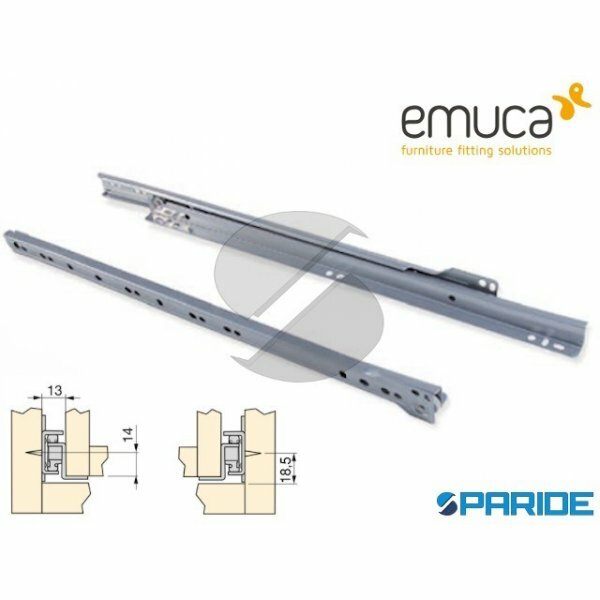 GUIDA MODELLO SLIPPE, PROFILO 440 MM, AD ESTRAZIONE TOTALE PUSH, ARTICOLO 3002405 EMUCA. GUIDA SLIPPE PER CASSETTI IN LEGN..
GUIDA SLIPPE 440 AD ESTRAZIONE TOTALE SOFT E AGGANCIO 4002905 EMUCA. GUIDA MODELLO SLIPPE, PROFILO 450 MM, AD ESTRAZIONE TOTALE SOFT E AGGANCIO, ARTICOLO 4002905 EMUCA. GUIDA SLIPP..
GUIDA SLIPPE 490 AD ESTRAZIONE TOTALE PUSH 3002505 EMUCA. 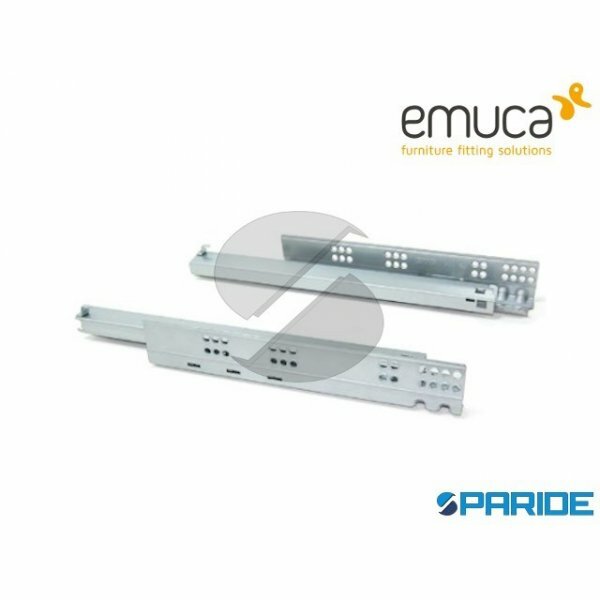 GUIDA MODELLO SLIPPE, PROFILO 490 MM, AD ESTRAZIONE TOTALE PUSH, ARTICOLO 3002505 EMUCA. GUIDA SLIPPE PER CASSETTI IN LEGN..
GUIDA SLIPPE 490 AD ESTRAZIONE TOTALE SOFT E AGGANCIO 4003005 EMUCA. 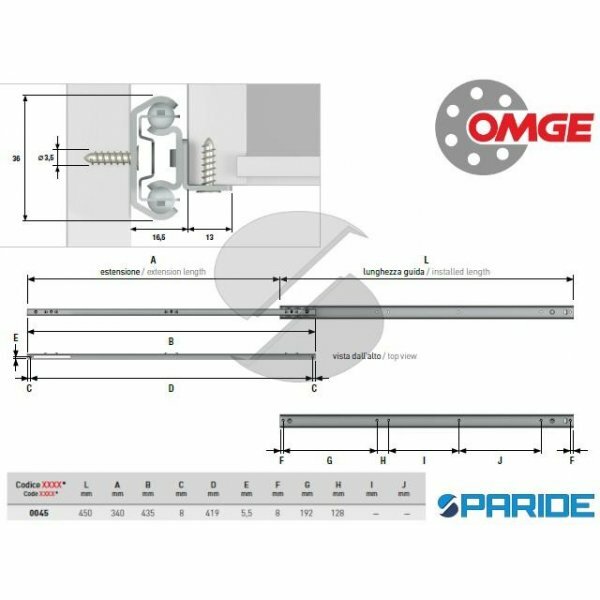 GUIDA MODELLO SLIPPE, PROFILO 490 MM, AD ESTRAZIONE TOTALE SOFT E AGGANCIO, ARTICOLO 4003005 EMUCA. GUIDA SLIPP..
GUIDA SLIPPE 590 AD ESTRAZIONE TOTALE SOFT E AGGANCIO 4008505 EMUCA. GUIDA MODELLO SLIPPE, PROFILO 590 MM, AD ESTRAZIONE TOTALE SOFT E AGGANCIO, ARTICOLO 4008505 EMUCA. GUIDA SLIPP..
GUIDE PER CASSETTI 300 MM BIANCHE SCORREVOLI MACO. GUIDE SCORREVOLI PER CASSETTI IN LEGNO. FISSAGGIO AL FONDO CON FLANGIA. PORTATA 60 KG STATICA, 25 KG DINAMICA, COLORE BIANCO, ALT..
GUIDE PER CASSETTI 300 MM ESTRAZIONE TOTALE BIANCHE MACO. GUIDE AD ESTRAZIONE TOTALE PER CASSETTI IN LEGNO. FISSAGGIO AL FONDO CON FLANGIA. PORTATA 40 KG STATICA, 25 KG DINAMICA, C..
GUIDE PER CASSETTI 350 MM BEIGE SCORREVOLI MACO. GUIDE SCORREVOLI PER CASSETTI IN LEGNO. FISSAGGIO AL FONDO CON FLANGIA. PORTATA 60 KG STATICA, 25 KG DINAMICA, COLORE BEIGE, ALTEZZ..
GUIDE PER CASSETTI 350 MM BIANCHE SCORREVOLI MACO. GUIDE SCORREVOLI PER CASSETTI IN LEGNO. FISSAGGIO AL FONDO CON FLANGIA. PORTATA 60 KG STATICA, 25 KG DINAMICA, COLORE BIANCO, ALT..
GUIDE PER CASSETTI 350 MM ESTRAZIONE TOTALE BIANCHE MACO. GUIDE AD ESTRAZIONE TOTALE PER CASSETTI IN LEGNO. FISSAGGIO AL FONDO CON FLANGIA. 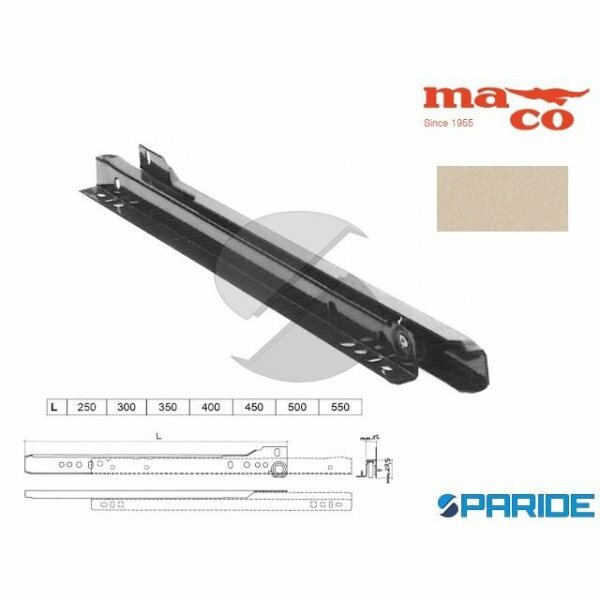 PORTATA 40 KG STATICA, 25 KG DINAMICA, C..
GUIDE PER CASSETTI 400 MM BEIGE SCORREVOLI MACO. GUIDE SCORREVOLI PER CASSETTI IN LEGNO. FISSAGGIO AL FONDO CON FLANGIA. PORTATA 60 KG STATICA, 25 KG DINAMICA, COLORE BEIGE, ALTEZZ..
GUIDE PER CASSETTI 400 MM BIANCHE SCORREVOLI MACO. GUIDE SCORREVOLI PER CASSETTI IN LEGNO. FISSAGGIO AL FONDO CON FLANGIA. PORTATA 60 KG STATICA, 25 KG DINAMICA, COLORE BEIGE, ALTE..
GUIDE PER CASSETTI 400 MM ESTRAZIONE TOTALE BIANCHE MACO. GUIDE AD ESTRAZIONE TOTALE PER CASSETTI IN LEGNO. FISSAGGIO AL FONDO CON FLANGIA. 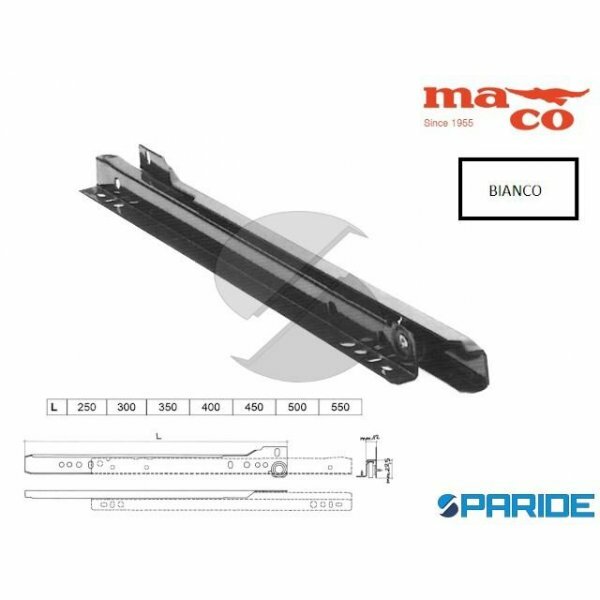 PORTATA 40 KG STATICA, 25 KG DINAMICA, C..
GUIDE PER CASSETTI 450 MM BEIGE SCORREVOLI MACO. GUIDE SCORREVOLI PER CASSETTI IN LEGNO. FISSAGGIO AL FONDO CON FLANGIA. PORTATA 60 KG STATICA, 25 KG DINAMICA, COLORE BEIGE, ALTEZZ..
GUIDE PER CASSETTI 450 MM BIANCHE SCORREVOLI MACO. GUIDE SCORREVOLI PER CASSETTI IN LEGNO. FISSAGGIO AL FONDO CON FLANGIA. PORTATA 60 KG STATICA, 25 KG DINAMICA, COLORE BEIGE, ALTE..
GUIDE PER CASSETTI 450 MM ESTRAZIONE TOTALE BIANCHE MACO. GUIDE AD ESTRAZIONE TOTALE PER CASSETTI IN LEGNO. FISSAGGIO AL FONDO CON FLANGIA. 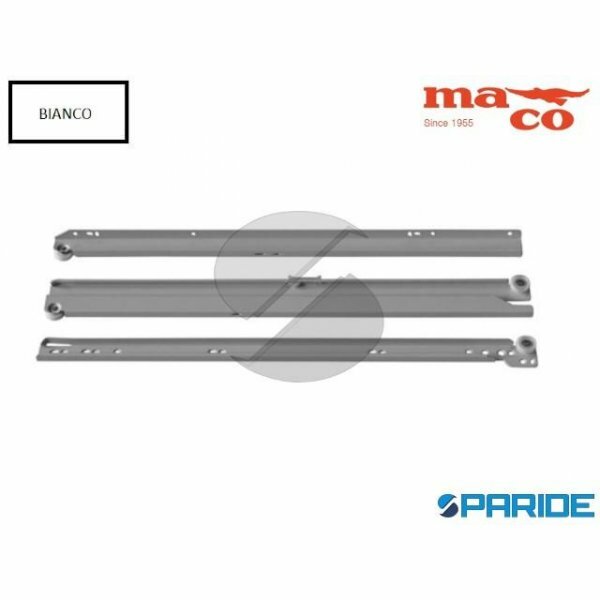 PORTATA 40 KG STATICA, 25 KG DINAMICA, C..
GUIDE PER CASSETTI 500 MM BEIGE SCORREVOLI MACO. GUIDE SCORREVOLI PER CASSETTI IN LEGNO. FISSAGGIO AL FONDO CON FLANGIA. PORTATA 60 KG STATICA, 25 KG DINAMICA, COLORE BEIGE, ALTEZZ..